If you follow me on Instagram, you've probably noticed how honest I've ben about what I wear every day. For those that know me / see me day-to-day, it's no secret that my style is pretty laid back. Don't get me wrong, though, I LOVE getting dressed up for a night out or for blogging events. But if I'm not earring a black sweater with jeans, I'm wearing gym attire. What I love about this "gym look" is that it isn't necessarily an outfit I would wear to the gym. It's casual, but edgy enough to look like streetwear. So I don't get the question, "Oh, are you heading to the gym?" I saw these super cool Fashion Nova Jax Joggers, and I knew that I wanted to build a look around them. 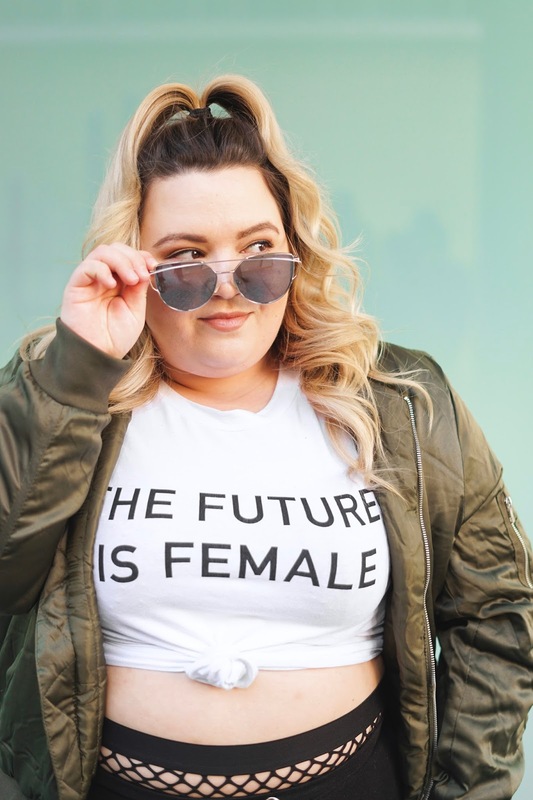 So I started with this The Future is Female T-Shirt and topped the look off with this Don't Tell Em Bomber, both from Fashion Nova Curve. I chose to sport my favorite Steve Madden Studded Platform Sneakers instead of my go-to black nikes to further instill that this IS NOT A GYM OUTFIT. I wonder why I hate when people ask me if I'm on my way to the gym when I am wearing workout gear. It's probably because it makes me feel lazy because I didn't put in the effort to dress up—not because I'm not going to the gym LOL. So I really like this look because it's the perfect combo between a look that took effort and something simple. 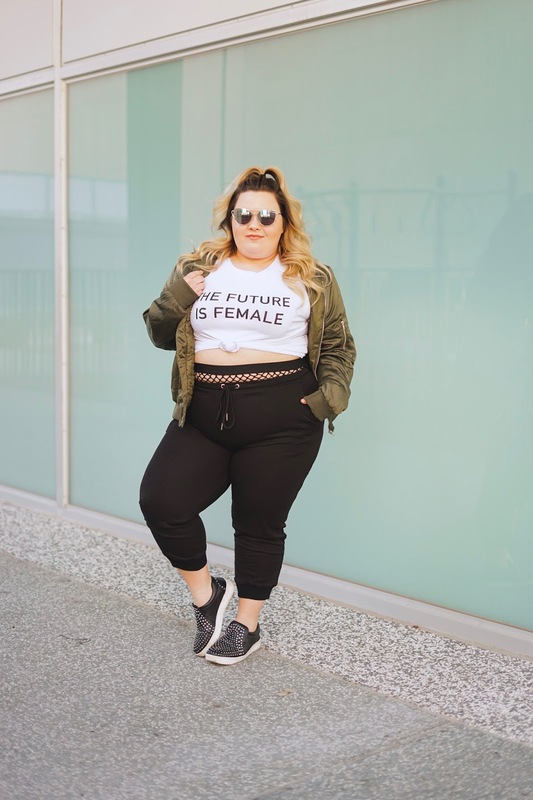 SIZING INFO: I am wearing a size 2x in both the Tax Joggers and The Future is Female T-Shirt, which is my actual size, and they both fit perfectly. I am wearing a size 3X in the Don't Tell Em Bomber, which is one size larger than my usual size. I sized up in the bomber because I wanted an oversize fit. Fashion Nova sent me this look to review. All opinions are my own!